First line: "Despite the suffocating mid-May heat and the nonbreathable fabric of my lavender polyester dress, it was shaping up to be a very good day." Twelve year old Lilah is ready to relax and enjoy her upcoming summer vacation with her best friend Alex when suddenly everything changes. Lilah is literally hit by a bolt of lightning at her mother's wedding to new stepdad Stan and is mysteriously granted the ability to hear the spirits of those who have passed, including her Jewish grandmother. Lilah's grandmother Bubby Dora encourages her to play matchmaker to her father, who still hasn't gotten over the divorce. Bubby Dora is loveably bossy and is also more than happy to try and push Lilah together with her longtime crush, Andrew Finkel, much to Lilah's mortified disbelief. Lilah's extended Jewish family seem healthy, balanced and loving, and the divorce of her parents is never really presented as a problem. This was a fast-paced, light-hearted read. 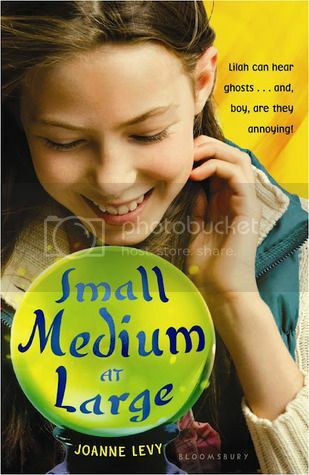 Middle-grade readers who enjoy a touch of magic with their realistic fiction will appreciate Lilah's sense of humor as she copes with all the joys and embarrassments of being a tween. I'll be recommending this for graduates of Megan McDonald's Judy Moody series or the Clementine books by Sarah Pennypacker.